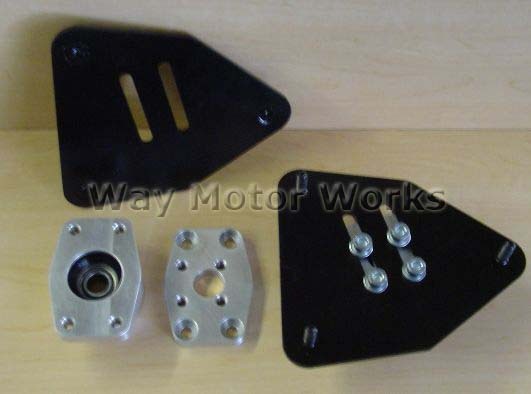 Ireland engineering adjustable camber plates for 2002-2006 R50 R53 Mini Cooper/Cooper S and 2005-2008 R52 MINI Convertible. These allow well over 3 degrees of negative camber for the front suspension. These plates have spherical bearings encased in urethane to offer some cushioning. These are for dual purpose cars that are street driven but are also used for track days and autocross. They do not require drilling any holes for install and your strut brace will still fit. Ride height will be approximately same as with the factory bearing. The bearings are replaceable which is unique to this brand. These will work with factory type springs or 2.5" ID springs as well as adjustable coil over systems like the Bilstein PSS9. Factory diameter springs will not allow full camber adjustment as they will contact the inner fender at around 2 degrees camber.